Adler began sometimes around 1983 though the idea had germinated a little earlier. At the time the only Napoleonic figures in 6mm scale were those made by Heroics & Ross. Nice figures but for the life of me I couldn't paint the little devils. A fact made worse by several people at the club who could paint them beautifully! I was at the time running and designing for Mikes Models so I started to experiment with designing figures in 6mm scale. I soon realised that the H&R figures were as they were because they derived from the WW2 infantry they did. These were very wee skinny fellas because the vehicles at that time were a bit 'squashed ', at the time moulding / casting technology was in its infancy and there was a lot more shrinkage so the vehicles lost a lot of height from top to bottom. Not I hasten to add a problem that H&R stuff suffers from the these days the vehicles casting and moulding are top notch. So when I started using GHQ ranges for WW2 I noticed how much bigger they were than the standard and that they had gone to 1./285 rather than 1/300th. For some reason ( nice easy steps I imagine like 25mm, 15mm etc. none of which numbers actually describe the height of the figures) 1/300th/285 became known as 5mm scale, it never was such a number but it did catch on. The actual height of a 1.285 scale figure is 6.4 from base of feet to eye level. This way of measuring figures rather then trying to measure to the top of the head shrouded in headgear started around this time and has since become pretty standard. All part of the scale creep so designers can make better proportion figures, the difference say from 15 to 18mm doesn't sound much but for a designer its like the difference between designing a small apartment rather than designing a 4 bedroom semi detached house. So when I looked again I realised that as the figures I wanted to make didn't have to fit in with vehicles, I could bulk them out a little so as make them easier to paint. When I did the WW2 ranges I had to reverse the process! 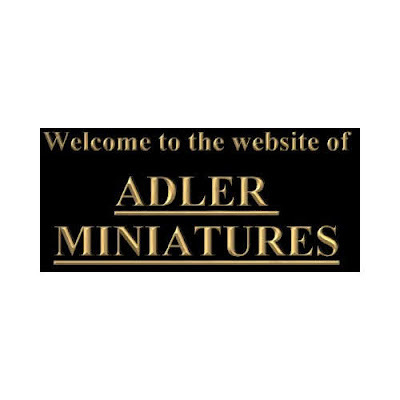 Adler was born then and over the mid 80's I started the business full time and here we are nearly 30 years later. 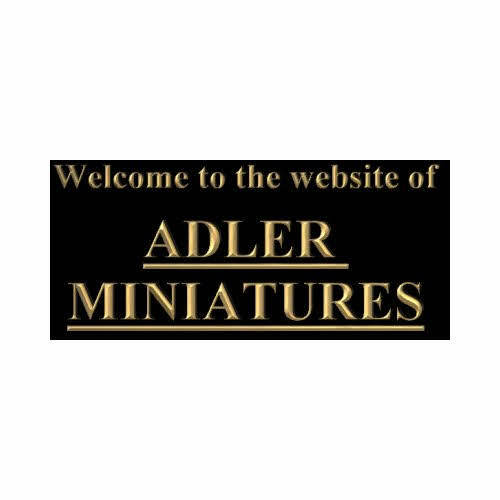 And in case anyone wonders the name Adler was chosen because at the time there were a couple of Eagle miniature firms in existence and being half German it seemed obvious to choose the German equivalent of eagle instead. So many plans for the future but getting the design time is always the problem, being a designer led outfit means that I do pretty much everything. At some point I plan to off load the production side of things so as to leave more time for doing the important bit. I have just started doing ancients in 10mm, considered them in 6mm for a long time but 10mm allows far more room for the character that is such a necessary part of the ancient period. Its a nice scale has the the advantages of both 6mm and 15mm and few of the disadvantages. Having got past the learning curve stage hope to accelerate the production of the 10mm line. Fear not however the Napoleonic remain a core part of the business and additions and remakes are constantly in the works. Well hoped you managed to stay awake till the end........er..hum.....wakey wakey! Kevin Hall a friend, adviser, owner of a jolly good library and demon van driver ! Hulon H Cox like all Texans larger than life and twice as generous, Mon Emperor ! David Mason, former owner of Mikes Models, gave me opportunities that meant I'm where I am now. Yeah right he's the one to blame! Aly Morrison one of the great designers who taught me a heck of a lot. Tony Barton, of AB figures for inspiring me to become a better designer. .
Chub Pearson of Denizen Miniatures we have been partners in various crimes for nearly 40 years and yet he still moans about my moulding and casting technique! Taught me more than I know about sculpting.